Junk Happens offers a complete package when it comes to junk removal in Eagan. As a customer, all you need to do is give instructions and we will work on the tedious tasks. Tell us where the junk removal should be done. Tell us what needs to be removed and what you want to see as a result. Why Should You Choose Junk Happens? Sure, there are thousands of junk removal Eagan MN companies out there. But, what really sets us apart as a company is we offer a wide range of services at an affordable price. We fully understand that our customers should always come first. We are a service company after all. We offer services in order to make our customers feel more at ease and relaxed. This has always been our mission from the start. We have hundreds of satisfied customers over the years, making us one of the most recommended junk removal service in Eagan MN. Here at Junk Happens, we strive to make the process easy. In three easy steps, we accomplish our job with confidence and ease. STEP 1 – Call us and set a date. And, be reminded that we have to set a two-hour window too in order to accommodate as many customers as possible in the day. STEP 2 – When we are ready to go to you on your scheduled appointment, we give you a call 15 minutes before we arrive so you can prepare and give us the right resources to start the job. STEP 3 – We discuss what needs to be done. If you agree with what we talked about, we can proceed with the job at that very moment! We are straightforward so you get the best results in a short amount of time. Junk Happens is one of the most sought-after cheap junk removal Eagan service companies in town. We offer a wide variety of services like junk removal, demolition and property clean-up, furniture and yard waste removal. In all of Eagan, we are the most reliable because of two factors — our reasonable pricing and our lineup of experts and professionals in the field of junk removal. As you work with us, you will discover that you will be proud that you have worked with one of America’s most responsible waste disposal companies! We make sure that we offer you these services in a hardworking, prideful, and honest manner. We are thinkers so we can provide you with the most effective way to accomplish junk removal Eagan by covering the basics and even the minute details of the work! Give us a call now and let us discuss what we have for you. Why should I consider Junk Happens for junk removal in Eagan? At Junk Happens, we offer a responsive, punctual, environmentally friendly, and a very reliable service for junk removal in Eagan MN. Our team is trained on how to safely lift, sort and handle your junk. And we charge based on the volume and not time. This means, you will be charged only based on the space your junk requires in our trucks and not on time to load it. Moreover, we recycle or donate your unwanted items. That’s why we are a ‘go green’ company. Can I hire junk removal in Eagan on short notice? Yes, Junk Happens offers, junk removal in Eagan MN on a short notice. Once you call us at 612-333-JUNK (5865) and let us know the type of help you require, we will visit your location in person, or talk over the phone and assess the situation. Depending upon the assessment, we will allocate the number of team members that is required for the work and help with junk removal as quickly as possible. We will remain pleasant, considerate, and helpful even with a short notice. Do you offer any discounts for junk removal in Eagan? Yes, Junk Happens offers a $10 discount when booked online for junk removal in Eagan. We also give an accurate estimate of how much of our truck and your junk will fill and what additional charges would be incurred. All our team members are highly professional, likeable, and sensitive in their dealings. So there are no surprise charges! What types of services do you help with junk removal in Eagan? Junk Happens offers a low cost and environmentally friendly junk removal solution in Eagan to residential and commercial customers. We help with all the loading, cleanup, pick-up, donating and removal of your unwanted junk. So that, you can sit & relax. We even sweep up after ourselves. The items we strictly cannot take are – Hazardous materials, paint, solvents, and oil. 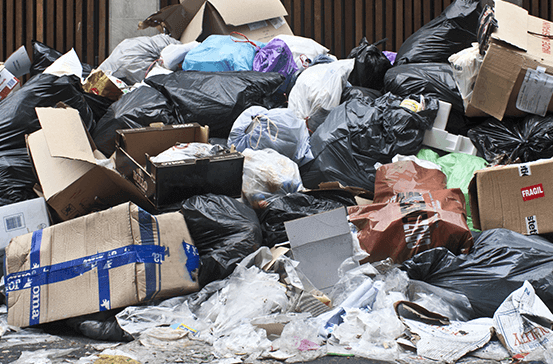 What are the factors that I should look for in a junk removal service Eagan MN? Look if they hold positive reviews and good ratings online. Junk removal in Eagan should be able to collect the junk in a short time and complete the task at the earliest. The junk removal team should consist of sufficient tools to handle all types of works and expertise to handle the resources. They should be able to discard the junk in an environment friendly manner, as the best junk removal companies – Recycle! Lastly, check if their services for junk removal in Eagan MN are Certified and Licensed and Insured.